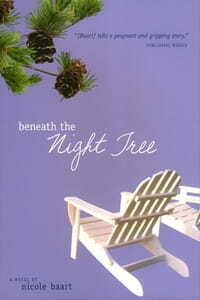 In Beneath the Night Tree, Nicole Baart concludes the story she began with her debut, After the Leaves Fall, and continued with Christy Award nomination Summer Snow. Readers who have been following the journey of Julia DeSmit and her grandmother Nellie will be thrilled to see the conclusion finally unfold. But Baart skillfully pens a tale that can stand alone, as well. New readers will not need the previous books in order to enjoy this one, though they may soon seek the earlier volumes anyway. Julia, single mother to 5-year-old Daniel and unofficial mother to her 10-year-old brother Simon, tells her story in first person. Her hard-won peace feels good. She is finally settling into her life—living with her beloved grandmother, working at the local grocery store, mothering two young boys. She is content with her situation. And the future looks bright. She and Michael, a surgical intern, are seriously dating, and she hopes to be engaged soon. Her family may be unconventional, but love and loyalty bind them together. Follow Julia’s journey from happily anticipating a proposal to fearfully wondering how this email will disturb her future with Michael. How will Parker’s presence in their lives—for he certainly becomes part of their story—affect Daniel, Simon, and Michael? Further complicating the situation is Michael’s subtle pressure to choose him over her unorthodox family. Julia walks a tightrope between her past and her future, her fears and her dreams. Will she learn to trust herself and God? Baart writes in flowing, lyrical prose, beautifully descriptive and full of truth. She displays keen insight into the thoughts and motives of a young woman who has reached maturity through mistakes, pain, and healing. Readers will empathize and sympathize with Julia as she attempts to balance everything only to learn that some things are worth dropping and others worth holding tight. Parker is the only character even slightly underdeveloped. Presumably he appears in at least one of the previous novels, but in this one he enters the scene as a humbled, matured man. We don’t learn a lot about what made him that way, however. No matter, because the focus of this story is directed more at Julia … and Simon. Simon stole my heart—and the show, in my opinion. The boy abandoned by his mother has been living with his grandmother and sister in a sort of limbo. Where does he belong? Does he belong to anybody, really? Simon’s burgeoning need for complete acceptance will resonate with even the hardest heart. Through him, the author explores humanity’s relationship with our Heavenly Father and our innate desire for belonging. Let’s hope that Nicole Baart continues to write evocative, insightful stories that communicate God’s truth. This latest offering is a gem.